Surprise, surprise! Canada has a housing bubble! 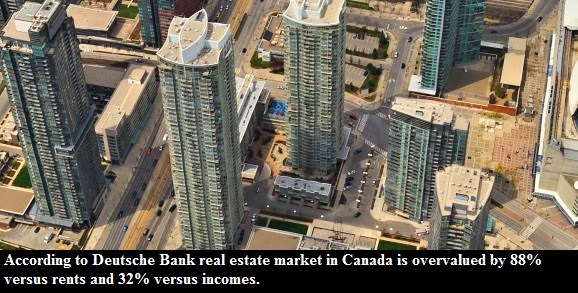 Using the same metrics as the IMF and the OECD, Deutcshe Bank came to the same conclusion about the property market of the True White North. No they didn't used the "B" word. Instead they simply called it overvalued. But that's just semantics. 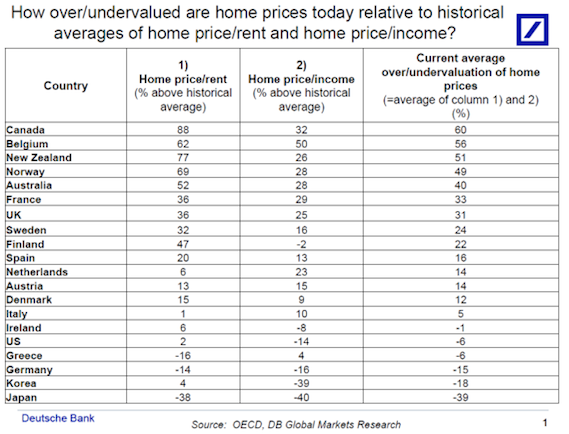 I am not really sure what's worse though - calling our property market a bubble or labelling it the most overvalued in the world. "Given that the GTA represents close to 20 per cent of the overall Canadian population, the outlook for the city remains robust, with the housing market in Toronto proper and the peripheral areas expected to experience sold activity for years to come." "By year end, an estimated 89,000 homes are expected to change hands in Greater Toronto - an increase of two percent over 2013, while average price is expected to continue its ascent, rising six per cent to $550,000 in 2014." By all means prices could rise 6% next year, and the year after. Real estate was going up in the GTA since 1996 and year after year vested interests published reports such as this one - talking about the positives and avoiding the negatives. And that is understandable - why should they jeopardize their own business? But as time went by and property prices rose, the imbalances built. Sooner rather than later the real estate uptrend will reverse - as it always does. What won't reverse is the real estate cartel's cheerleading. Sometimes it takes an outside look to grasp the situation we are currently in. "Based on their analysis, anyone in the market for property might want to avoid Toronto or Vancouver."